Are Sanders Supporters Really Staying Home? Since Hillary Clinton clinched the Democratic nomination, there have been many articles and polls questioning her ability to unify the Democratic Party, particularly when Bernie Sanders performed better against Donald Trump than she was in many polls. In fact, one of the last polls to include the Trump v. Sanders matchup was Quinnipiac at the end of May, which showed Clinton leading Trump by 4 points (45 percent to 41 percent) while Sanders led by 9 points (48 percent to 39 percent). This narrative has died down a little over the past few weeks, and our recent polling shows there is good reason why. Yes -- there are some big differences between the Sanders supporters who are currently behind Clinton and those who are holding out their support, but the vast majority of Sanders supporters are likely to come home to the Democratic Party's nominee by November 8th. In our national poll of 1,000 adults, including 930 registered voters, Clinton is leading Trump by 12 points (45 percent to 33 percent) with slightly less than one-in-four (22 percent) undecided at this time. As we have discussed in a previous piece, the high number of undecided voters is a bit of a misnomer, but it is still troublesome for many partisans out there who fear that Clinton will be unable to convince Sanders voters to turn out and support her on Election Day. However, according to the results of our poll, Clinton is well on her way to earning the support of Democratic primary voters -- including Sanders supporters. Even though Senator Sanders has not yet endorsed Clinton and there are still a couple weeks to go until the convention in Philadelphia, according to our data, Clinton has already brought the vast majority of Sanders voters to her side. In fact, Clinton is currently winning two-thirds of Sanders primary voters (66 percent), while 27 percent remain undecided and 7 percent say they are planning on voting for Trump. In more good news for Clinton and Democratic supporters, there are many indications that these holdout voters will end up supporting Clinton by November. Not surprisingly, Sanders voters have very different opinions of Clinton than those voters who supported the former Secretary of State in the primaries. In our poll, nearly half of Sanders voters (46 percent) have an unfavorable opinion of Hillary Clinton while 94 percent of Clinton voters hold a favorable opinion. While this is not ideal for Clinton, both voting cohorts do agree when it comes to their opinion of Donald Trump. Indeed, 84 percent of Sanders voters have an unfavorable opinion of Donald Trump, including 68 percent who have a very unfavorable opinion, while 83 percent of Clinton voters share the same opinion of the businessman. Additionally, a plurality of Sanders primary voters who are currently supporting Clinton say that their general election vote has more to do with supporting Clinton than opposing Trump. While Clinton clearly has work to do to convince Sanders voters to vote for her instead of simply voting against Trump (72 percent of Clinton primary voters say their vote is more for Clinton than against Trump, while 37 percent of Sanders primary voters say the same), the common enemy in Trump is enough to ensure that these voters are unlikely to go away. Furthermore, 60 percent of Sanders primary supporters say that there is at least a 75 percent chance that they end up supporting Clinton in November while just 23 percent say there is less than a 50-50 chance they will end up supporting the former Secretary of State. 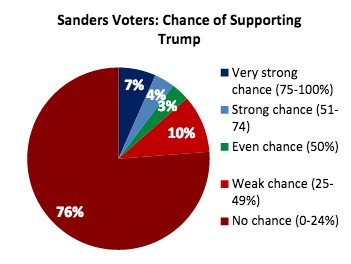 This 23 percent sounds high, but 86 percent of Sanders supporters say that there is less than a 50-50 chance they end up supporting Trump. Just 17 percent of Sanders supporters say there is less than a one-in-four chance they end up voting for Clinton in November, or 3 percent of registered voters. Lastly, Sanders supporters agree with Clinton on more issues than they do with Trump, particularly among Sanders voters who are supporting Clinton in the general election. Nearly three-quarters of this cohort (74 percent) agree more with her on foreign policy, closely followed by abortion (72 percent), immigration (70 percent), and LGBT issues (70 percent). Similarly, over three-in-five Sanders voters who are now supporting Clinton agree more with her on national security and terrorism (65 percent), the economy (65 percent), and international trade (60 percent). While Clinton has clearly won over these Sanders voters on all fronts, there is a stark difference between Sanders voters who are now voting for Clinton and those who are still undecided or say they are voting for Trump. The Sanders holdouts do not agree more with her on most issues, but in many cases over 20 percent do not know enough about her position or Trump's position to have an opinion, or they agree with both equally. Given the stark differences the candidates have on these issues as the campaigns continue, we would expect these numbers to come down. 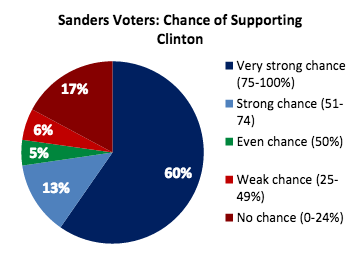 Clearly, some of Senator Sanders' supporters will not vote for Hillary Clinton regardless of what she does or says. However, the situation is not as dire as many people have made it out to be. As Trump continues to take extreme positions on the issues and Clinton works to appeal to Sanders supporters, Sanders supporters will continue to come to her side less reluctantly. Whether they want to admit it or not, the vast majority of Sanders supporters plan on supporting Clinton in November.